Upon approaching Jeffrey Deitch’s reclaimed gallery in Soho, a passerby with a glimpse into the interior, may initially mistake it for a clothing boutique. 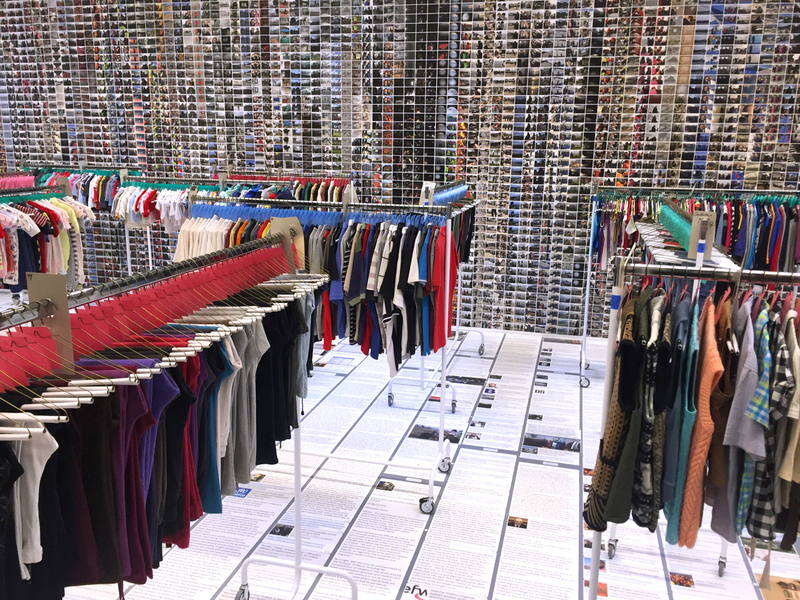 Inside, racks upon racks of clothes —men’s, women’s and children’s styles— hang, pressed and organized by garment type in what could be described as a maze. On a nearby west-facing wall, stretched floor to ceiling, is a series of photographs pulled from Instagram, organized into a dizzying wallpaper. A melancholic acoustic guitar, looping can be identified coming from somewhere in the space, not initially evident. Without having read the press release or any other information regarding this exhibition, titled Laundromat by Ai Weiwei, it wouldn’t be difficult to question the racks —clothing and accessories— wondering, “Are they for sale?” In the American mindset a highly populated retail district like Soho, both within the realm of a boutique and at the core of every commercial gallery, usually everything is for sale. Looking down at the gallery floor, an entire world of news ready items is revealed. Headlines gleaned from the social media of NPR, CNN and other various news outlets are in a particular blue that we associate with a live link. The only other colors indicate the various news companies and their respective logos. After walking the entire breadth of the gallery before exiting every visitor much watch the video on the second tier, far left back wall. Leading up to the video if approached from the front, are rows of aligned shoes. Like the clothes, they’ve been cleaned and organized although some stand alone, the single shoe of what once was a pair. The shoes function almost as a textural, metaphorical red carpet, leading the visitor to the true crux of the exhibition. Accompanied by an elaborate wall text divided into three sections, the video at first replicates the barrage of images we’ve all seen of refugees on the news, in the papers, flashed across websites and even imitated and turned into fashion by Kanye West in collaboration with Vanessa Beecroft for his Yeezy 3 line, launched in February 2016. Yet as one’s gaze becomes more focused on the moving parts on the screen, there is a difference; this is not news footage, it is the vision of an artist, someone who is researching and experiencing it first hand. It is a world we read about, listen too and see on television, but rarely encounter in person. What Ai Weiwei has done with Laundromat is share his invested interest on the struggle surrounding the refugee crisis, a political statement in poetry. 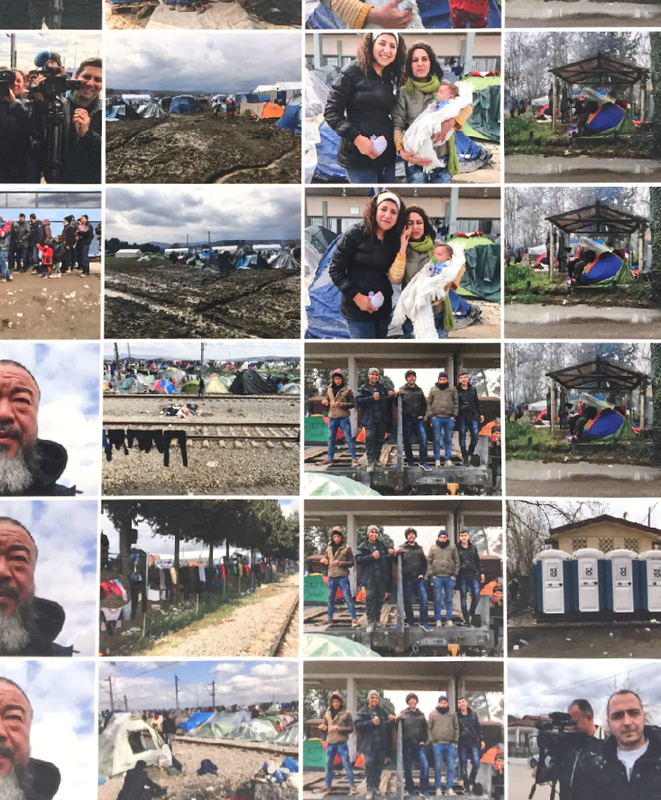 In the spring of 2016, shortly after West’s clothing line was debuted at Madison Square Garden in New York, Ai Weiwei visited a refugee camp in Idomeni, Greece. Thousands of refugees have passed through this area on their way to Europe and many have remained, in stasis unable to move further. Around 15,000 men, women and children mostly from Syria, Afghanistan and Iraq, were there in the spring months of this year when Weiwei visited. At a time when the artist himself was unable to travel from his homeland of China, he had assistants do interviews with various groups of refugees asking questions such as, what brought them to the camp and where they hope to be at the next stage of their lives. On March 9th, 2016, the Western Balkan route, providing a path for refugees and migrants to move from Greece through the Former Yugoslav Republic of Macedonia, was closed resulting in 15,000 men, women and children left in a state of being in-between; not belonging in Greece and not at the end goal of choice which for many includes Germany. Anyone who attempted to cross was shot with rubber bullets or met with tear gas by border patrol. 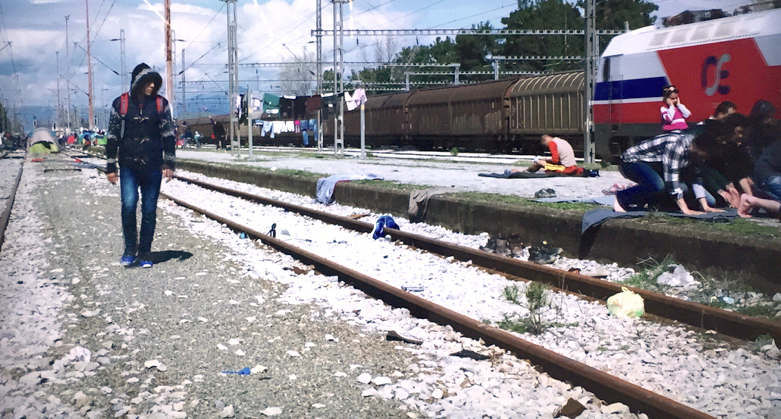 On May 24th, 2016, Idomeni was evacuated and the remaining 8,400 inhabitants were divided. Some were transported to other Greek refugee camps while many fled into the mountains with hopes of still finding a solution to cross the border. Carrying what they could, much was left. A curated selection of those items are what we now see in Laundromat, hanging from racks and neatly organized in rows on the floor. 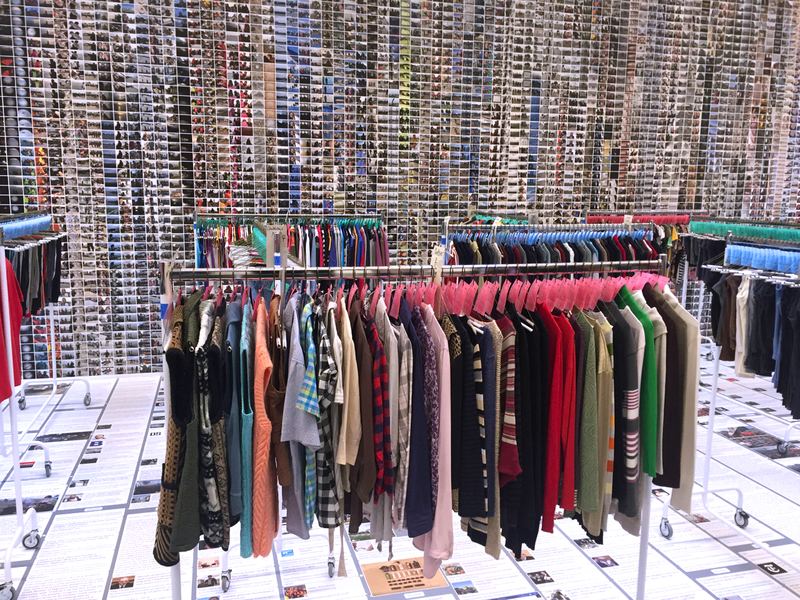 Ai Weiwei’s installation at Jeffrey Deitch is layered and tactile, literally and metaphorically. The work is dynamic and unexpected and one’s reaction may be as well. From what initially looks like a designer second-hand shop, each item becomes human, flesh-like. Every piece of clothing was once on a body that may or may not be comfortable, may or may not be still alive. One of the most important, even didactic elements of this exhibition is the documentary style video shot on location. Edited down to a short loop, it ventures between the refugees —men, women and children in crisis— of Idomeni and Ai Weiwei both in the camp and later in his studio with their clothing. In an accompanying text, the artist states that after all of the refugees left, he and his assistants gathered what they could and through a process of washing, drying and ironing each item, sought to renew the breadth of humanity back into that which had been discarded or left behind. The clothes in the gallery are these bodies. They alone represent the forgotten, the unwanted, the lost. In a nearly perfect response to the nearly conceptually laughable performative fashion show premiering Yeezy 3, Laundromat removes the edifice of a façade and instead gives new life and awareness, to the very real situation of so many people across the world. 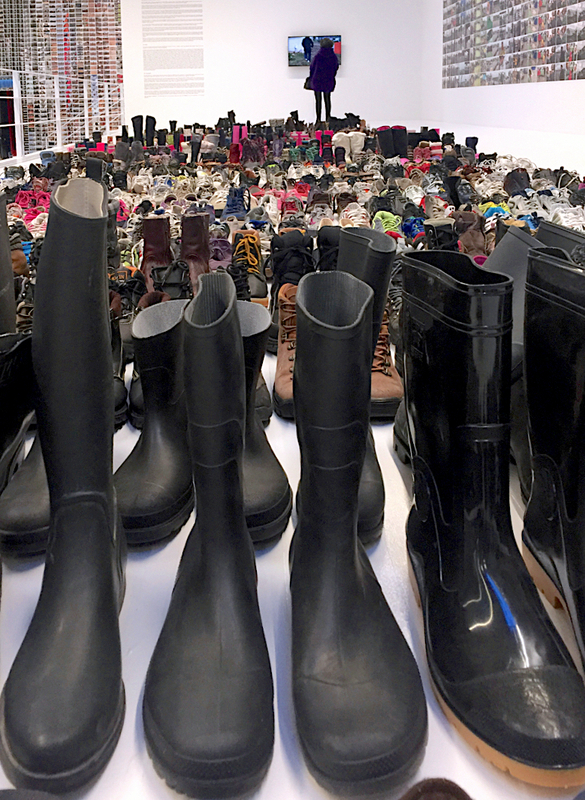 Rather than sell fashion as is West’s objective, Weiwei is selling an idea, a point of view and an element of hope. West’s world caters to a pop-culture audience, a photographic reconfiguration of refugees on a stage with the intention of selling designer clothing. In the other, clothes are used as stand-ins for the bodies that were once in-between the many seams; appendages extended through armholes and pant legs. From Understanding Media: The Extensions of Man, by Marshall McLuhan, 1964, “Archimedes once said, ‘Give me a place to stand and I will move the world.’ Today he would have pointed to our electric media and said, ‘I will stand on your eyes, your ears, your nerves, and your brain, and the world will move in any tempo or pattern I choose.’ We have leased these “places to stand” to private corporations.” Art can not, and should not, always be about pleasure. In fact, it should be uncomfortable, sticky, irritating, difficult to understand. This is what makes it art and gives us as viewers something to explore visually, psychologically and within the frame of art history. Rather than feel some inevitable sadness in this exhibition, it is also important to allow oneself to look. Currently showing work in Deitch, Mary Boone’s fifth avenue and Chelsea locations along with Lisson Gallery in Chelsea, Ai Weiwei makes prescient work. While the installation at Jeffrey Deitch is the most successful of the three venues, they all house works that like a small seed contain pertinent information needed for growth. It is rare to see such emotionally relevant, museum quality work, tucked away on a cobble-stone street in the center of Manhattan, but such is the case with Laundromat commenting on yesterday and simultaneously today. Not since Christian Boltanski, “No Man’s Land” at the Park Avenue Armory in 2010 has an artist said so much about a body, without showing one. Ai Weiwei Laundromat is on view at Jeffrey Deitch Gallery 18 Wooster Street, “Roots and Branches” is on view at Mary Boone at 745 Fifth Avenue and 541 West 24th Street and another iteration of “Roots and Branches” is on view at Lisson Gallery at 504 West 24th Street in New York. All of the shows are open to the public until December 23rd, 2016.